Making decisions is hard. Making decisions under uncertainty is doubly hard. Uncertainty abounds in the modern information age: Marketplaces shift, customer preference adapt to new trends, technologies get “disrupted” at every turn, industry best-practices get amended … the list of changing unknowns is endless. A decision making model is necessary for success in an uncertain world. In this post you will learn about the Control Based (CB) decision making model. It will help buffer against uncertainty by focusing on the entire decision process, not just the decision itself. By doing so, the goal is to reinstate your control so that you can increase your efficiency in the decision making process. As always, our team of psychology and neuroscience PhDs have reviewed more than forty academic studies in decision science, behavioral economics, and cognitive neuroscience and constructed this model from the body of research. People are creatures of habit. And yes, routine is good for your brain because it takes away the cognitive load that would otherwise overwhelm us. It is much easier to rely on pre-existing mental patterns. Familiarity is safe, effortless, and easy. Unfamiliar situations, on the other hand, require more of your attention and effort. Consider an everyday example. When you brush your teeth, you can fill your mind with several things at once and clean your teeth at the same time. You may even busy yourself with a task simultaneously, like read an email or send a text. However, if you brush your teeth with the non-dominant hand, all your attention is given over to that novel sequence of actions. You don’t have a motor based “program” wired for that slightly different physical experience. And as a result, an automated, fluid response becomes effortful, cognitively demanding, and stressful. Same goes for the uncertainty that you encounter when making decisions. What is normally a seamless choice process, uncertain decisions are inherently more effortful. That in turn clouds your judgement and slows down your ability to think clearly. You feel like you don’t have control → You get anxious about lacking control → Anxiety clouds your judgement → Your decision making is impaired → you feel like you don’t have control → and on and on it goes. It’s a vicious cycle that starts with the feeling of not having control; the emphasis here being on feeling. Since emotional states are evaluated based on subjective interpretation, you can put things in place to regain the feeling of having more control. A key point to applying the CB decision making model is that feelings of control are necessary for effective decision making. This brings up the question, what actually constitutes a decision? 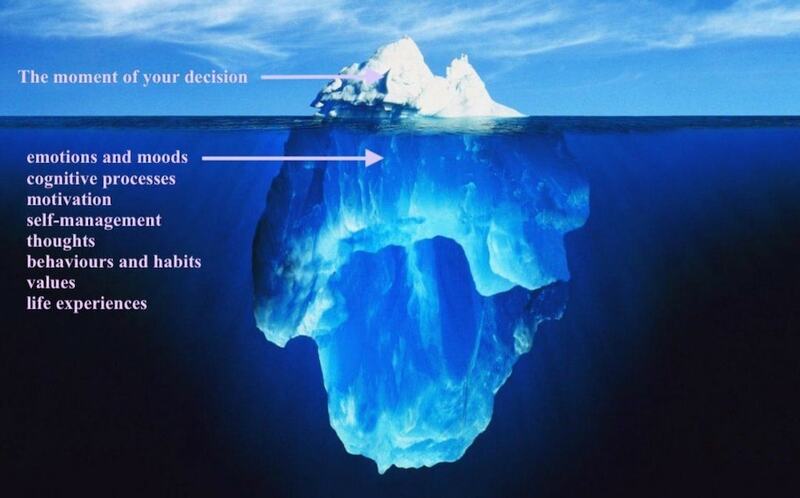 Decision making is like an iceberg. The actual moment of making a choice – what we typically think is a decision – is merely the tip of the iceberg. All the build-up beforehand happens underneath the surface, without you realizing. That said, the CB decision making model is designed to optimize for all that lead-up in the decision process. It’s meant to reinstate control so that by the time you arrive at the tip of the decision iceberg, you’ve done the legwork and lined up your dominos. Focus on one particular decision point in the uncertain context. Very often, when a person experiences one form of uncertainty, their brain’s default response is to generate a “spillover” effect, bringing to mind other sources of uncertainty and being extra sensitive to them. In your notepad, write down the context and the uncertainty surrounding it. Along the left-hand side of the page, write three categories, each corresponding to the elements that constitute the uncertainty of the situation: Data, Parameters and Predictability. For each of the items below, give it a score from 0 – 100 (with 100 being the high end). Data refers to how much information you have at this very particular moment. Ask yourself, how much data do you have in helping you navigate this uncertainty? Everything that you need to consider when making a decision is considered one parameter. How many parameters will you need to estimate, to consider all possible outcomes? Assign a predictability score for what you know based on the data you have and parameters you need to consider. If you have a lot of data and not many things to consider, it will be easy to predict the outcomes. On the other hand, if you have very little data and a high number of parameters, your outcomes will be difficult to predict. Now, based on your evaluation, if the situation you’re in involves a high degree of uncertainty, then continue on with the following. Such default cognition gives a false sense of control, but has a negative impact on our decision making process. But the good news is, they can be reversed by focusing inward and relying on the sequence of steps of the CB decision making model. By challenging these three aspects, you can regain internal control so that when it comes time to make a choice, you feel like the decision point is driven internally rather than on a set of external (and often unknown) factors. Personal management deals in the human psychology triangle of thinking, feeling and acting. Due to the structure of our psychology and brain, you don’t have to tackle all of them at once. They are all interlinked; a change in one necessarily means a change in the other two. When things are uncertain, it’s easy for our default cognitive heuristics to skew our judgments and hinder our ability to make effective decisions. Be aware of the following biases. What it is: you tend to look for and attend to information that confirms your beliefs while ignoring the information that challenges your beliefs. That way, you cut yourself off to important information that you need to make an effective decision. How to tackle it: Play the devil’s advocate by proving yourself wrong. For example, if you think that option A is the most beneficial, write down on a piece of paper all the possible reasons why you think it’s the best. Then, for each point, write down why it may not be true. Be critical. This strategy can help with thinking outside the box by increasing your creativity and leading to more definitive choice outcomes. What it is: You tend to stick to ideas that already took some of your time or money. It is a doubling-down on a plan even when doing so doesn’t make sense. Abandoning the existing plan and going with something new doesn’t get considered a viable option because of the inflexibility of the heuristic. How to tackle it: When you want to make an effective decision, draw a clear cut-off point for what you consider a success or failure as a follow-up to your decision. Every once in a while, check if your outcomes are above the cut off point. If they fall below, it is a clear signal for you to change your strategy and go for another option. Do not stick to the original one hoping that things will turn around at some point. Another tip: Advertise your cut-off point to others. Socializing as a pre-commitment can ensure you stick to the original plan. This is a very simple exercise that is linked with mindfulness. The beauty of it though is that it’s a body-based exercise. This means it’s effective for those people who don’t care for the sitting-still aspect of traditional mindfulness. This technique involves tensing and relaxing one muscle group at a time. You start, for example, by making a tight fist, and then letting your hand relax. Then, you move to your arm and do the same. Then your back, other arm, legs … Until you go through every major part of your body. This technique has proven to help reduce uncertainty and negative arousal in the body: reduction in bodily arousal leads to a calmer and more balanced emotional and cognitive state, which in turn leads to more effective decision making. Another simple method to deal with rushing negative emotions is to write down everything that’s buzzing in your head. Write down how you feel, what you fear most, and what is most pressing for you in the near future. There’s no instruction other than to write. Using the psychoanalytic technique of free association, you simply write out everything that pops into your head. Write down the emotion that you feel at the moment (stressed, anxious, sad, angry, excited). Make sure you have a non-judgmental attitude towards yourself when you do it. All emotions, even the negative ones, are part of human experience. They come and go. Accept them as they are and learn how they make you feel. That in turn, can help you reduce negative emotional impact of uncertainty and embolden effective decision making. Focusing on your actions can help bring clarity into the decision making process. What is particularly important here, is that your actions should follow your own opinions. When you face uncertainty in your decision making, your automatic tendency is to act in accordance with what others say. However, your perspective as the decision maker is crucial because no one else can understand the situation as well as you do. Seeking additional information or advice from others, while helpful in some limited situations, can often be overwhelming. Thus, taking personal ownership of your decision can make the process more efficient. You don’t need to contemplate a multitude of differing viewpoints. In what follows, we will walk you through a couple of core tactics to manage your behaviors in decision making, by building healthy information-seeking habits. Usually, when you seek other people’s advice, you give them a high-level summary of the issue, and then listen to their opinion. While that can be sometimes helpful, it can also steer you in the wrong direction. If you want to talk it out with someone else, focus on describing the problem rather than finding a solution. Their role is to find out as many details as possible, and they should take an active role of asking questions and getting the information out of you. They should not give you any direct advice, certainly not right away. It’s very easy to believe that other people are right, even if you initially think otherwise. Most likely you will doubt yourself and conform to their opinion, even though you were initially right. Same goes for decision making. Your intuition is a great tool. But it isn’t factual. It is often difficult to justify the decision based on your intuition, which puts you at the risk of being easily influenced by other people. For example, if you say you want to do something ‘because it feels right’, your colleagues and teammates can convince you that another option is better because they have their own personal data. But research shows: When making decisions under uncertainty, past personal experience trumps supposed facts. Always focus on your initial solution – identify which option seemed the best at the very beginning. Make a mental note of it, and even write it down. Do I consider that option because of other people? Would I consider that option if it wasn’t for others? Do I feel that it is a good option in a very general sense? On a visceral / emotional level? We tend to think that situations just happen to us, full stop. But in fact, we have a high degree of control over situations. We can choose where we go, what we do, who we associate with, and how we do react to those situations. In every situation that ‘happens’ to us, we always have a degree of control and we can always change the process as well as the outcomes. Control over decision-related situations can help ease the negative outcomes of uncertainty, the same way as personal management does: by giving you the feeling of greater control over what is happening. In what follows, we will give you the most common examples of situation management strategies, and how they can be built into a decision making model. What it is: willingly choosing certain situations that already exist. Situation selection refers to seeking certain situations, but also avoiding situations that have a negative impact on you (and your decisions). When to use it: when you have several situations linked to your decision making process. For example, you can choose to make the decision by yourself, while having a quiet moment in your office or at home. You can also involve other people in the situation, or consider your options over a glass of wine or beer in a bar. Place: where do you focus best? Do you like some ambient noise and people traffic? Or do you need a closed-in office room? Time: we behave differently depending on the time of the day. In fact, there’s a whole science of time for optimizing our different behaviors in a day. Creativity and open style thinking is best done in the first few hours of waking. Routinized action is best done later on in the day. What it is: willingly changing some aspects of the situation that you are already in. Modification means you take an active role of ‘engineering’ the situational circumstances you are in. For example, you don’t like networking but you know it’s important. At a networking event among unfamiliar faces, you’re feeling particularly anxious about the level of uncertainty you have to face. What can you do? Look around the room and assess the people you think look the friendliest. Target these individuals to talk to them first and build that initial confidence. It will help to ease your anxiety and reduce the uncertainty. When to use it: When you are already in a situation linked to your decision making process. For example, if people affected by the decision must be present in the process, that means the situation is predetermined and you cannot choose a different one. What aspects of the situation trigger negative emotional response? What aspects of the situation are mentally exhausting? In other words, what situational elements make you feel bad or tired or depleted? Once you identify it, modify that specific aspect. For example, if you feel that the presence of other people blocks you from fully expressing your opinion, you can choose to send an email with your thoughts before the meeting. As you apply these tactics, remember the decision iceberg. There’s all sorts of things happening before the onset of the actual decision. Knowing this, you will feel you are in control despite the uncertainty in the environment. Your decision making will be transformed as a result.